Welcome back friends! Here comes the best part of "the job", getting to announce the Top 5 and Prize Winners! 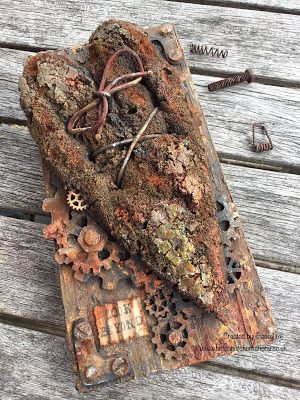 You are the heart and soul of why we do this, and it is truly my pleasure to make the announcements for our Summer steampunk/industrial "Anything Goes" challenge. We had so many wonderfully creative entries, it really was difficult for the team to chose the Top 5, so...we are going to have a TOP 6 for our summer challenge! Our prize winners are drawn at random from all proper entries. 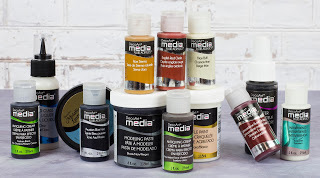 Our generous friends at DecoArt Media, and the lovely Glenda at Boozybear provide the amazing prizes! As always, we are very thankful for their support. Congratulations on your prize wins, and thanks so much for joining us in our challenge! 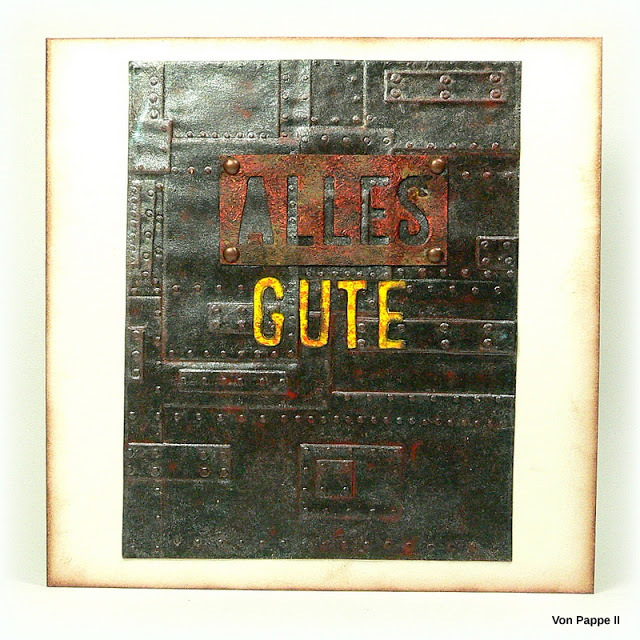 Please email Claudia (vonpappe2 - her address is in the sidebar) so she can forward your shipping details to Glenda and DecoArt asap. 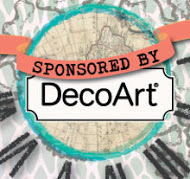 DecoArt winners, please include a phone number. Thank you for sharing your amazing makes and wonderful inspiration with us! 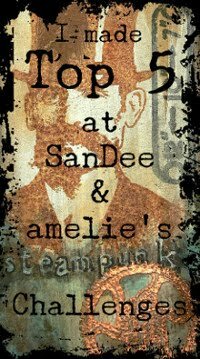 Please feel free to grab the Top 5 badge from above (or the sidebar), and display it on your blog. MANY THANKS to everyone who entered our special Summer challenge! It is always so difficult for the DT to pick the Top 5 from all of the awesome entries, because we truly are inspired by the creativity of each and every one of you. 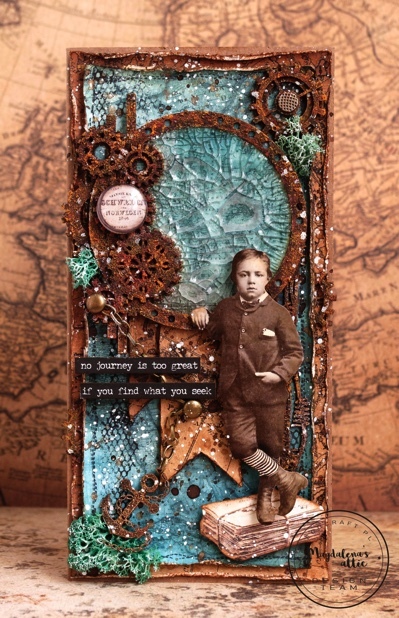 We are so happy to have all of you playing along with us at SASPC - you rock our little steampunk universe! The September challenge is open until the end of the month, so you still have plenty of time to create and share with us. We would love to see you link up your makes and enter our challenge this month, so please join us in our steampunk/industrial mixed media challenge! Namaste! 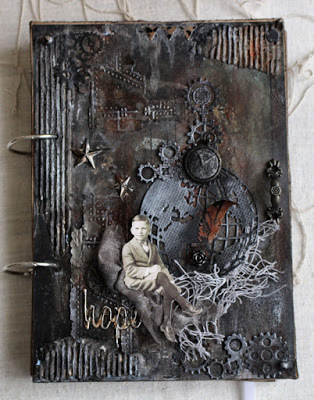 Hello and welcome, friends, to our little corner of the Steampunk Universe! Maura here this month guiding us along in the airship SASPC. Go ahead and get yourself a nice hot cup of tea or coffee, or whatever you like, and settle in with us and just enjoy some great inspiration on this month's journey. We are really happy that many of you joined us for our Summer Challenge! 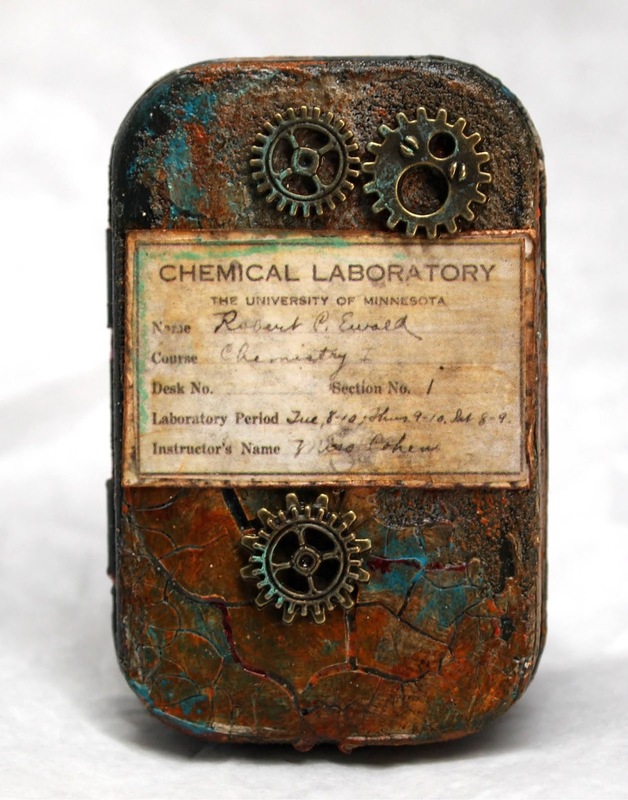 So many truly creative Steampunk and Industrial projects - you really inspire us! 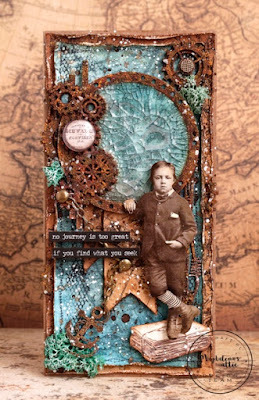 We love having you here playing along with us in a mixed media steampunk and industrial style. Once again, the design team is sharing all makes at the beginning of the month, which will give you lots of inspiration to get started. 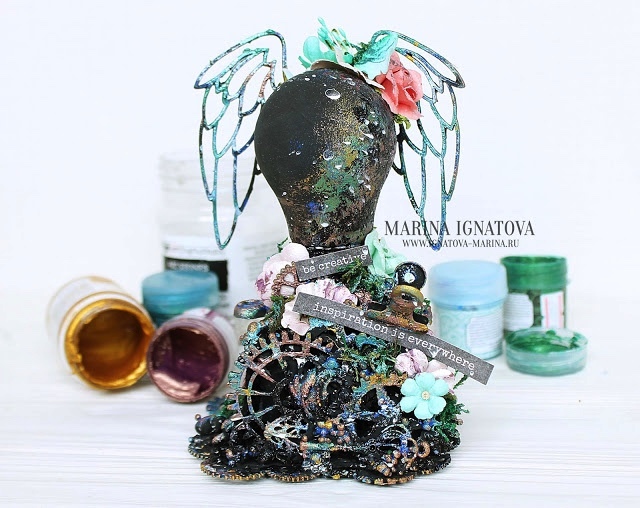 We welcome all types of projects (except digitally created) and encourage everyone, from beginner to experienced to join us every month and share your creations. 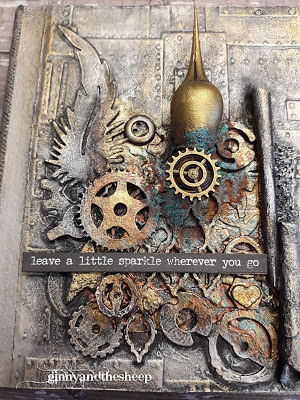 Show us your tag, card, canvas, art journal, altered object...whatever you can imagine that fits our steampunk/industrial theme. We truly are in awe of the imagination and creativity of you, our players, and look forward each challenge to see where your creative muse took you. 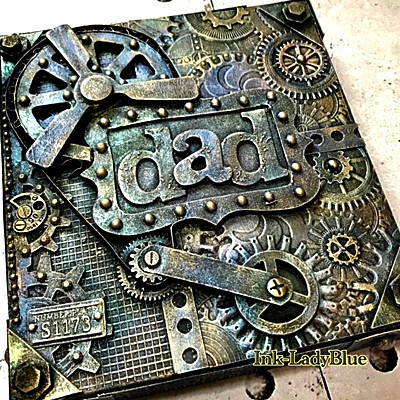 Many thanks to our wonderful and generous sponsors, DecoArt and boozybear, for keeping the gears and cogs turning here at SASPC! 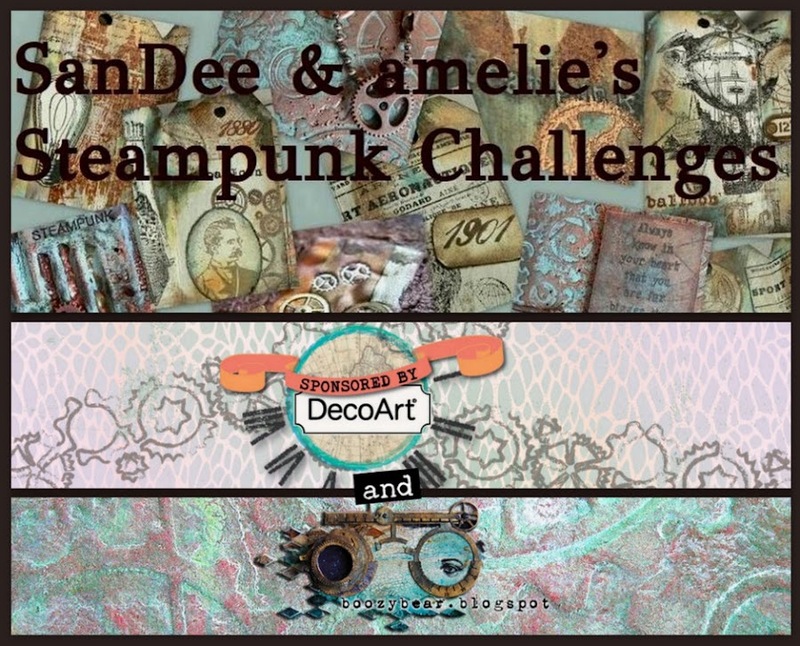 At the end of each challenge, two winners are randomly selected from all proper entries (be sure to check out our posted rules) and will get either an awesome DecoArt Media prize package, or an amazing boozybear chipboard package. 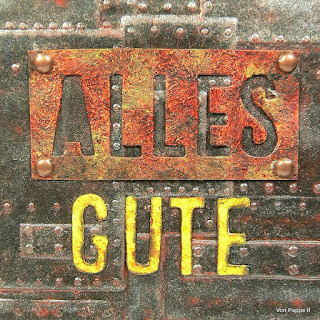 Now...enjoy the awesome makes from our wonderful team! 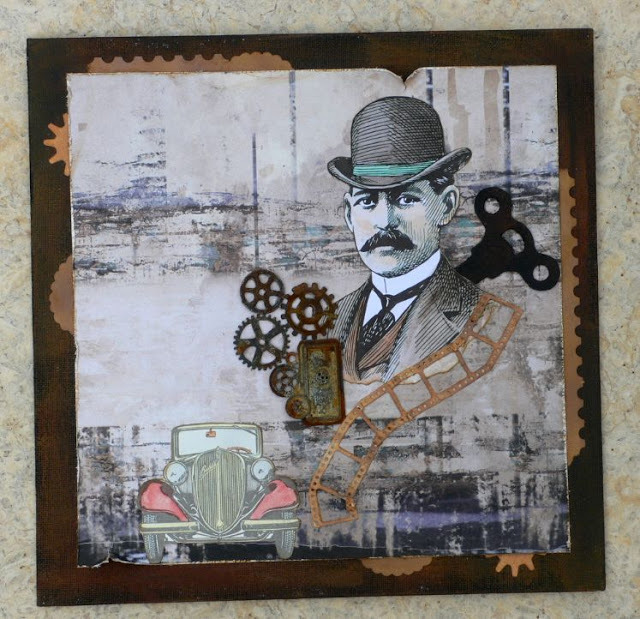 ...has created this dapper gentleman's canvas with watercolor and images. He certainly looks like he is ready for an adventure! 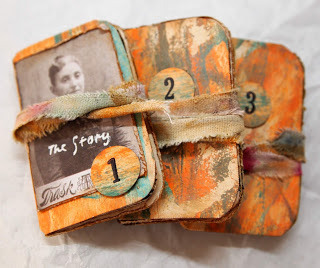 ...and filled it with tiny story books. I am really curious now about the stories inside the tin. She kept the design quite simple so the focus remains on the beautiful background and the quote. 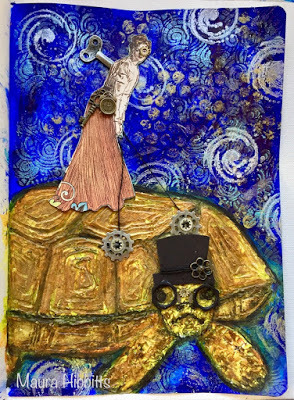 ...has let her imagination loose again and can be found somewhere in the universe, riding the back of a giant tortoise. Life is certainly an adventure when you travel at tortoise speed! ...made a mixed media cover for an new journal in an industrial style. That young man looks ready to take on the world with his confidant air. 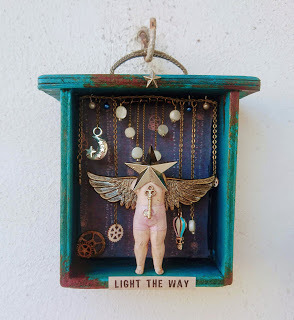 ...altered a tiny old drawer into a shadow box filled with intriguing treasures. Using the drawer handle to hang it is ingenious. Thanks again for stopping by our little corner of the Steampunk Universe. 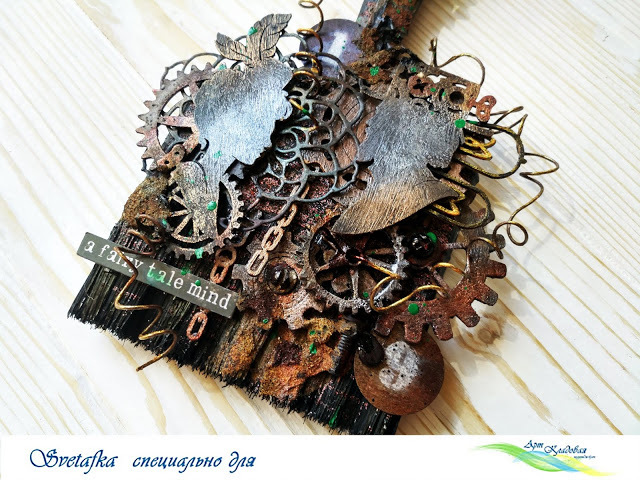 We hope you will play along with us this month in our steampunk/industrial challenge which is open until the end of September. We will have two prize draws and choose the design team's Top 5, so be sure to pop back on September 15th. to check that out. Time to adjust your top hat and goggles and get crafting with us!